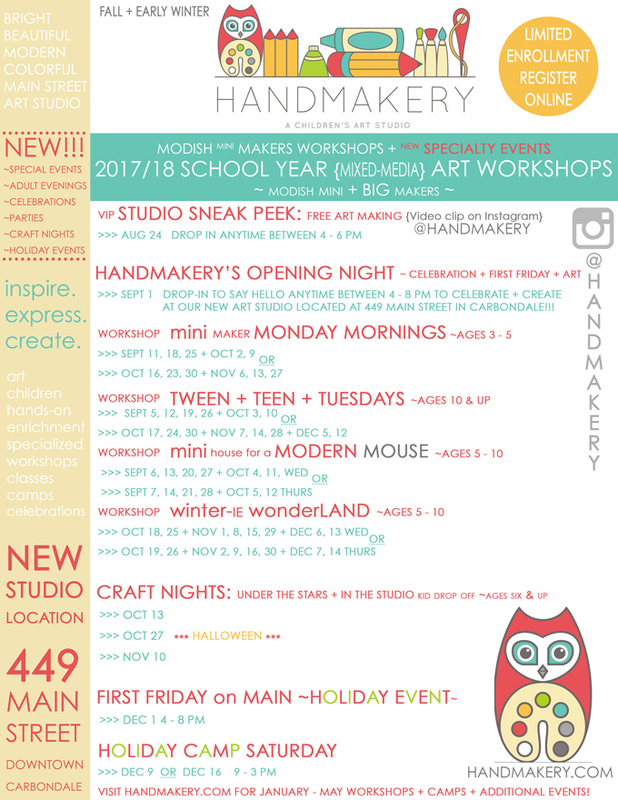 HANDMAKERY » Opening Night Celebration! 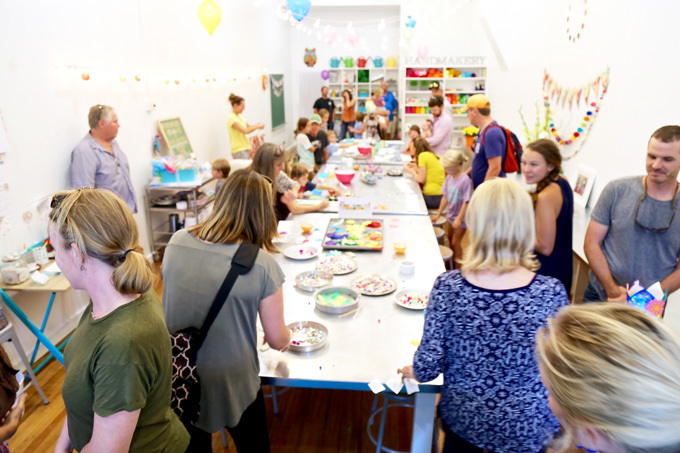 First Friday was our ~ Opening Night Celebration at our NEW art studio location at 449 Main Street in downtown Carbondale | CO! 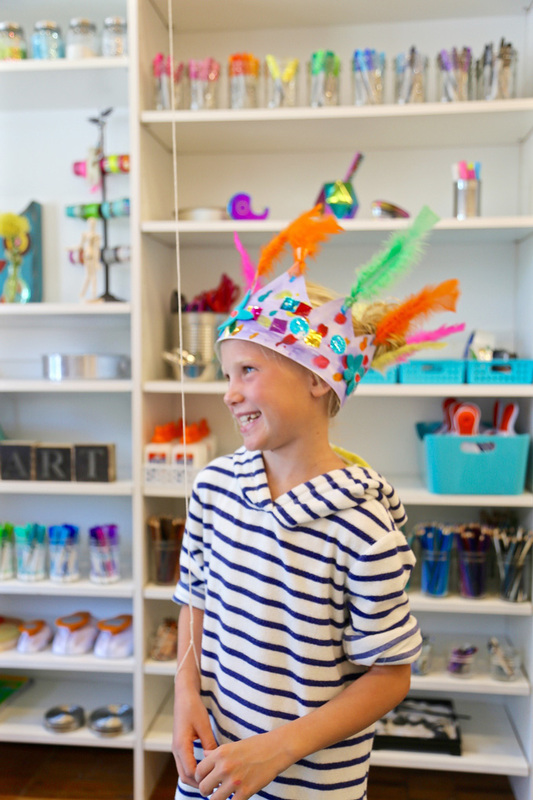 With a wide array of ages and not knowing exactly how many guests we’d have joining in, we kept it celebratory + simple + full of dazzle, painting and embellishing ~ Celebration Crowns! Main Street was blocked so everyone could enjoy an evening strolling the streets of historic downtown! 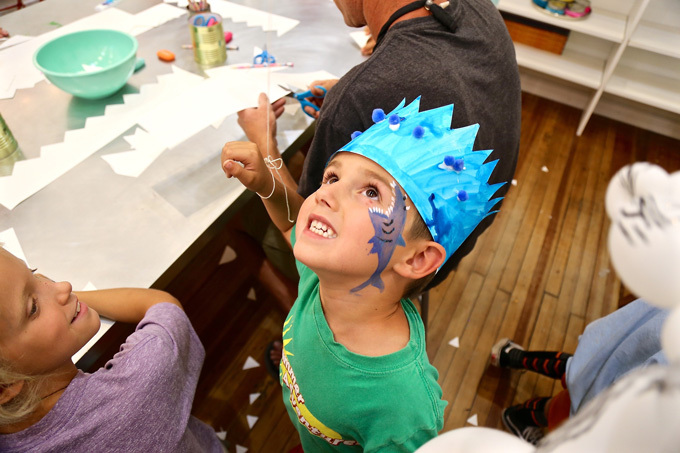 The night was festive and full of flavor, with everyone back-in-town from summer adventures. 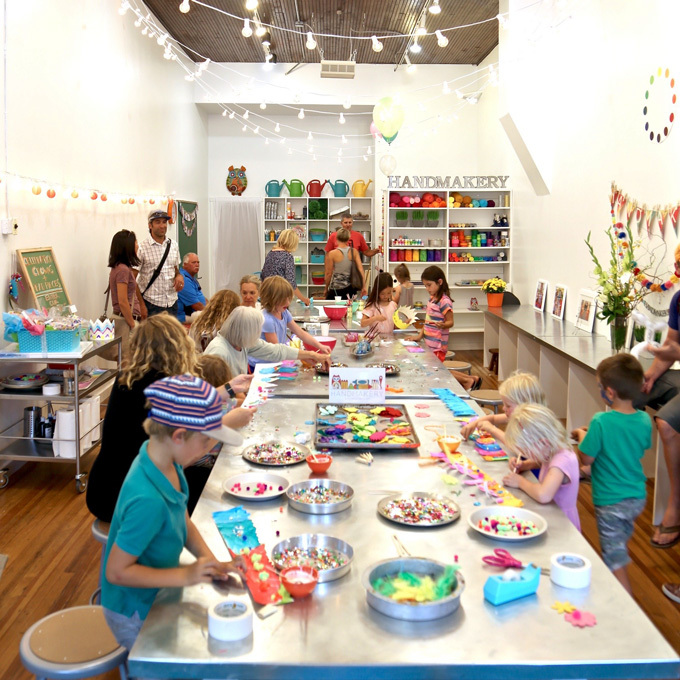 The community was alive, vibrant, and actively adventuring around this artistic town! 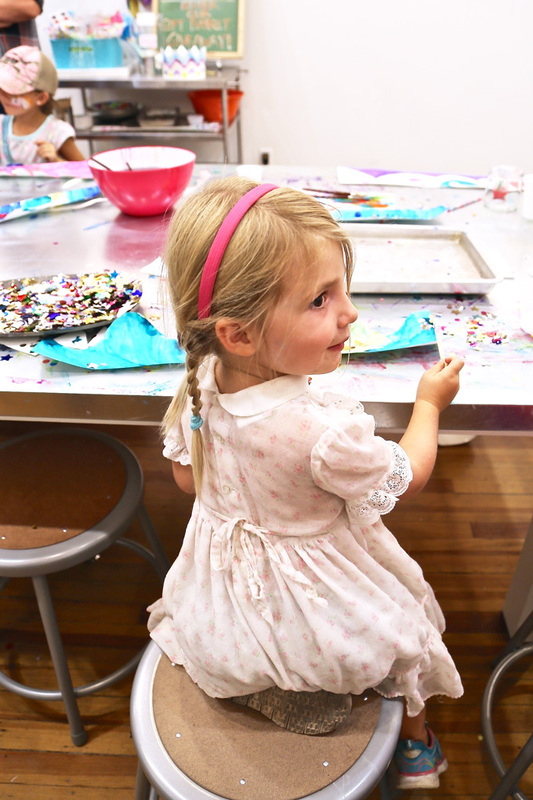 A peek into the NEW studio in artful action! 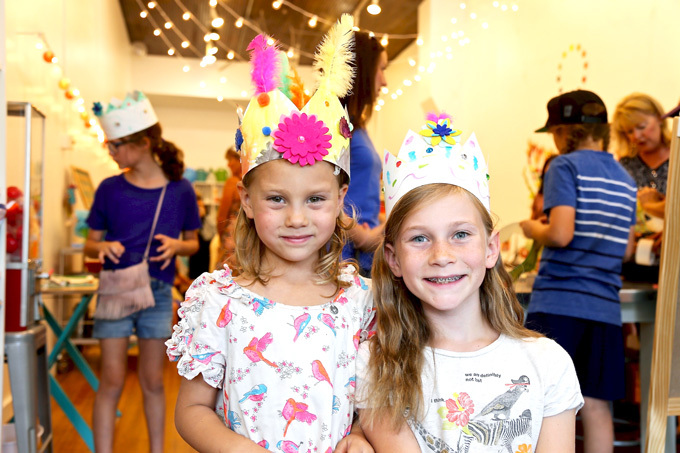 HANDMAKERY’S doors officially opened up at four o’clock for mini makers to explore the NEW studio space and handcraft a marvelous ~ Celebration Crown! 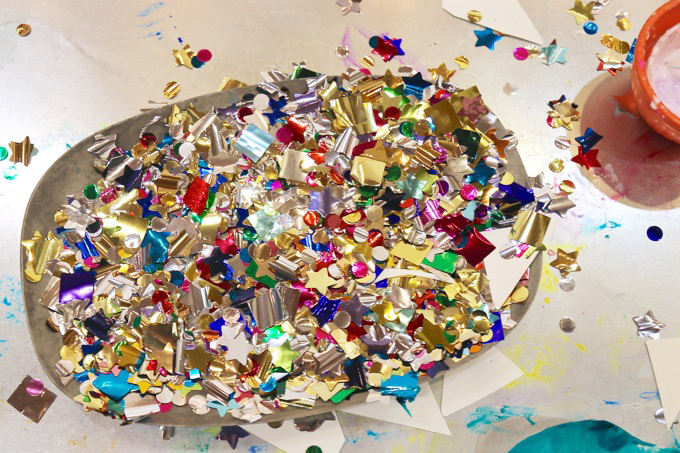 By 8 PM the time-worn floor of our 100+ year old historic building looked like a New Year’s party sparkling with rhinestones, glitter, confetti, pom poms and bits of cut paper. One hundred and thirty crowns had walked out the door, and 300-400 community members had stopped in to say H-E-L-L-O before the night was over! 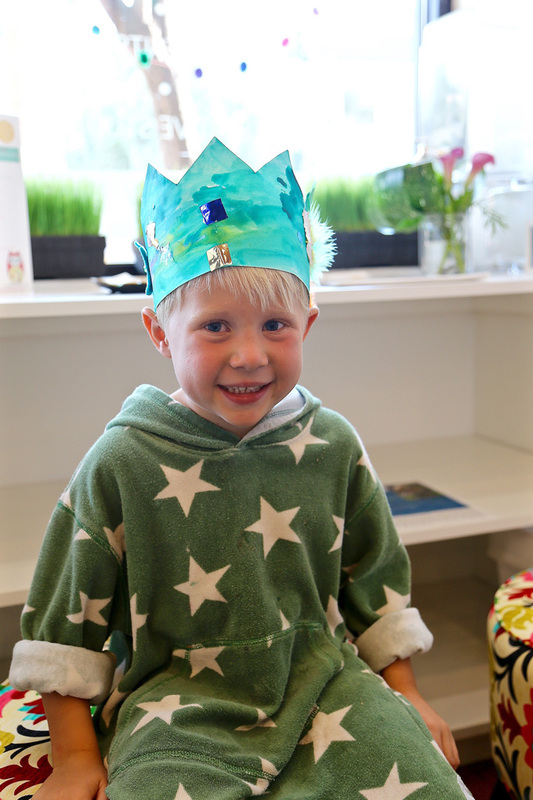 This proud artist and his mama-maker teamed up on the most elaborate ~ Celebration KING Crown. Look at all the detail to this storyline, oh my!!! 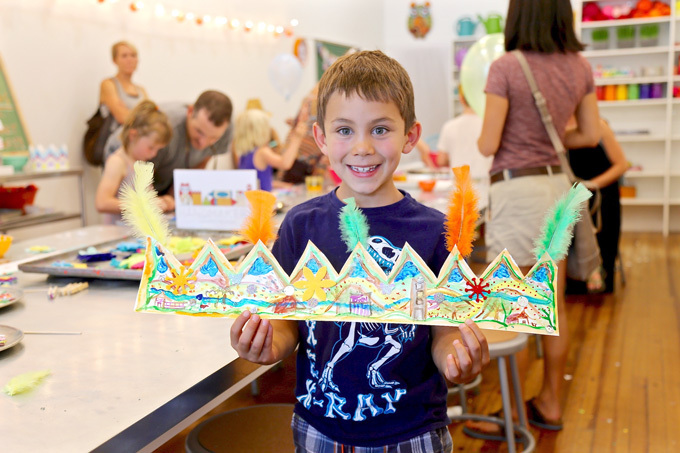 A happy artist and her beautiful ~ Celebration Crown! Love her added flightful feathers! This artist, all her lovely patterns, vibrant color palette, so stunning and ever so stylish! 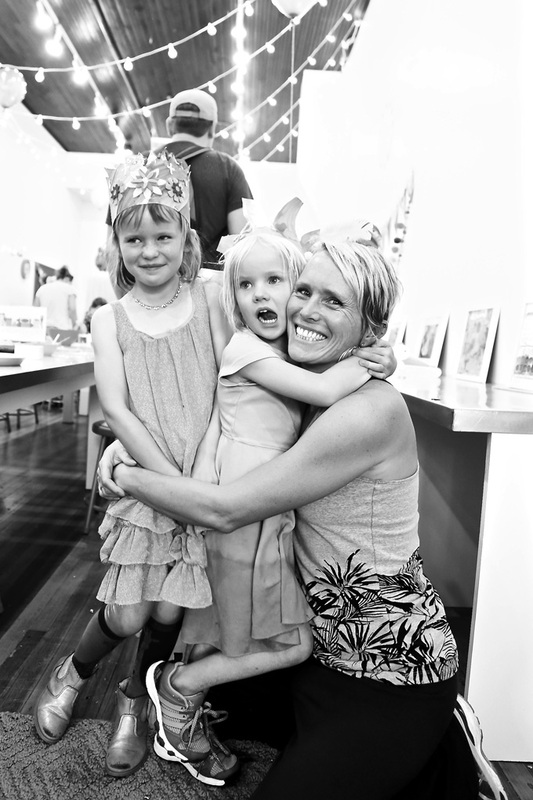 A tight squeeze captured here with these three beauties! 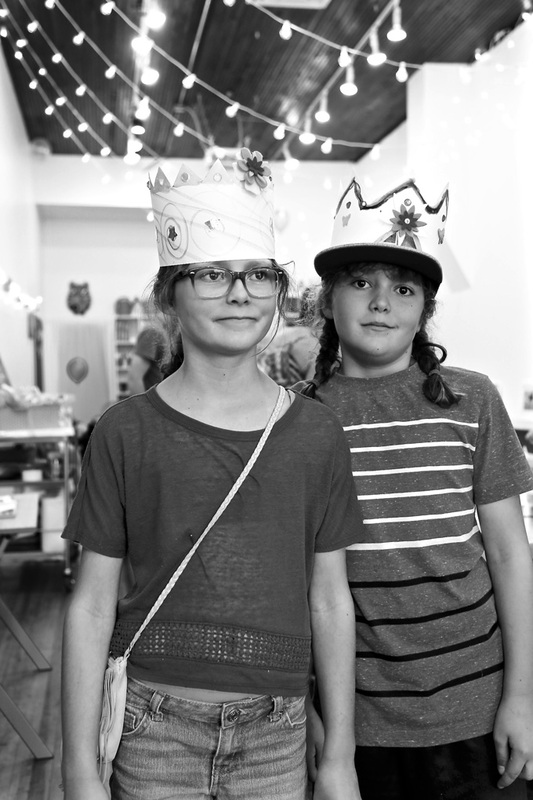 Two of my favorite sisters sporting their spectacular + stylish headpieces! So in love with this bird dress, a bigger size!?! Yes, Please! Lulubelle Carbondale! A night of hunting for bits + baubles. Did we tell you, we handed out over 100+ balloons!?! Definitely a huge hit with the littles! Soulful sisters, you might also know these two from two+two! 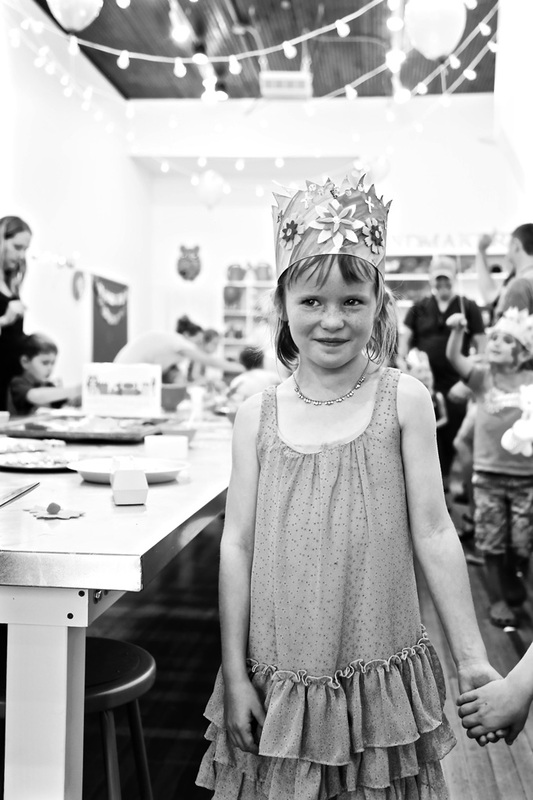 The youngest artist of the eve to create a ~ Celebration Crown with her daddy…and daddy, how is your crown staying on at that angle!?! The face painting happening downtown was such a compliment to the evening. It almost appears this artist matched his artwork to his face painting. A BIG ocean with blue bubbles as a shark is on attack! Technically our first guest of the evening, Prince Charming. When he walked in the door with his mama + sister, little did we know what the night would bring! Definitely the calm before the storm! Between 4 – 8 PM we had a packed house. 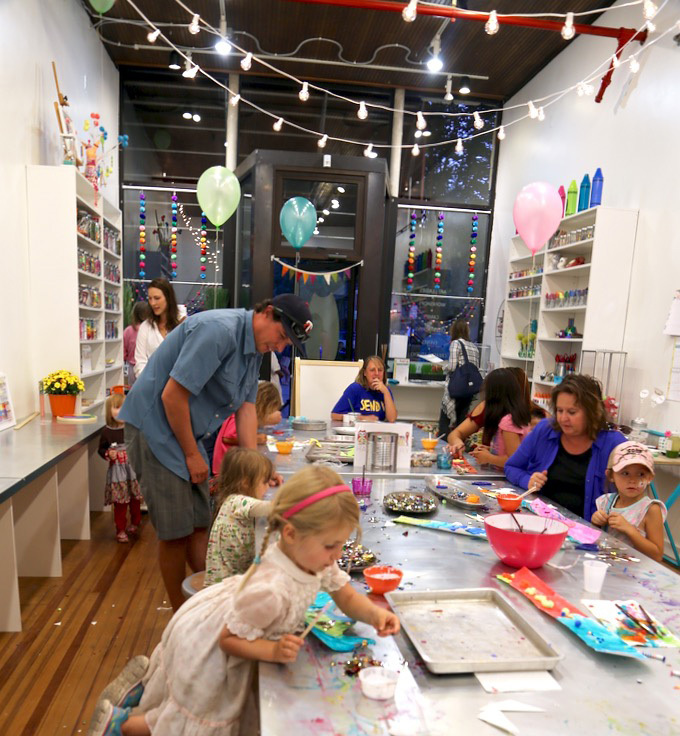 We estimate between 300-400 people stopped in throughout the evening to create, to say hello, and to see the NEW studio!!! Thank you for welcoming us to downtown Carbondale, Colorado and into the Carbondale Creative District! This little one’s mama said this was once her very own dress as a little girl. 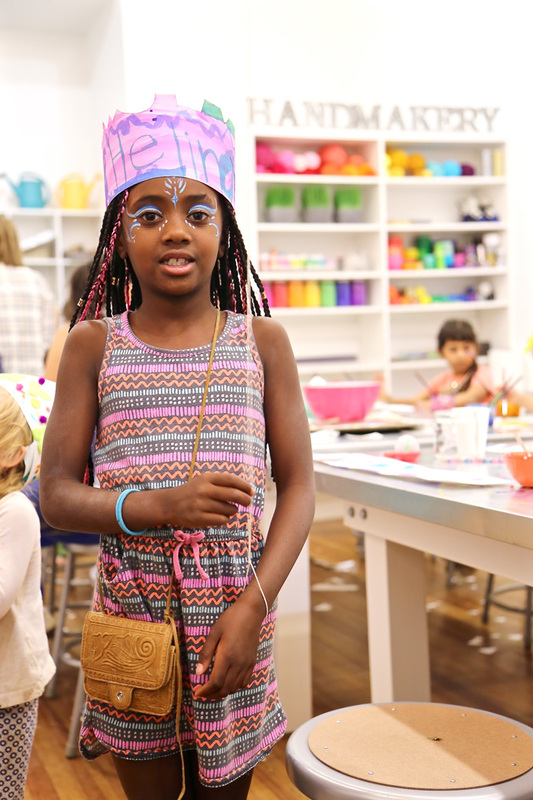 We sure hope it survived all the art supplies of the evening- sequins, confetti, feathers, felt, liquid watercolors, pom poms and glue …after all these years! Love these little piggy tail braids with her delicate headband, and tennis shoes to accent! Definitely, a celebration to remember! 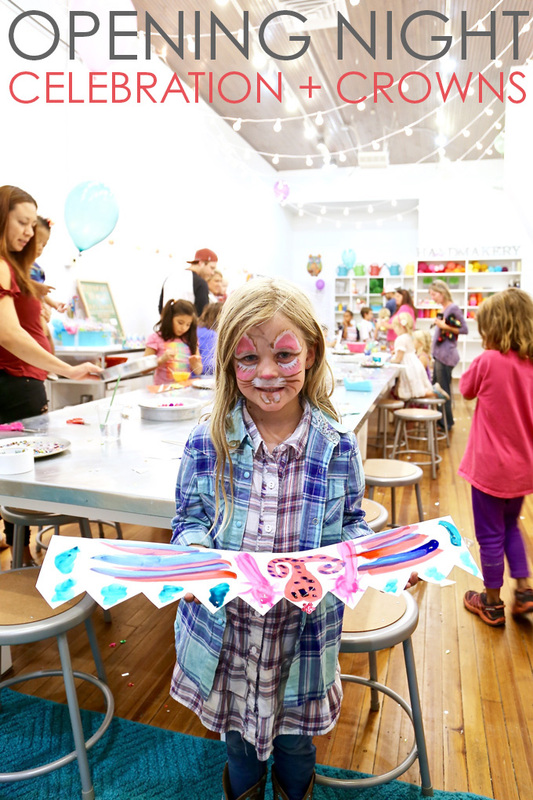 A HUGE THANK YOU to everyone that joined us for our ~ Opening Night Celebration! 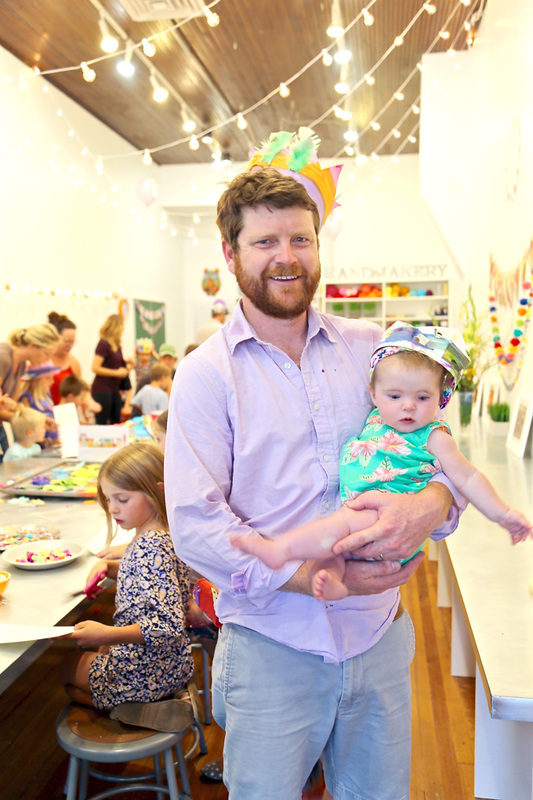 We look forward to seeing you around town and at our NEW downtown location!